Dacromet how to distinguish between true and false? _ Industry Knowledge _ Xinxiang Chui Auto Parts Co., Ltd. In daily production, how to distinguish this problem of the Rockwell coating? The first is the washing method: The Nile is water-based coating liquid, the use of flake zinc powder in the liquid, in the bottom of the container, there will be a small amount of metal powder precipitation. Most of the flaky metal powders are mixed in the solution. At this point, you can deposit the metal powder at the bottom of the container to see if it is spherical powder. The method is to take a beaker of 500 ml and place the metal powder at the bottom of the selected container in the Beaker. In the cup into 400 ml of deionized water, with glass rods stirred, at this time, such as flake powder, it will be like washing the fish water, the entire water present silvery white, flake powder will be suspended in the water, put on 30 minutes later, There is only a small amount of metal powder on the bottom, most of which are still suspended in water. If it is spherical powder, or that kind of cake powder, it will sink into the bottom of the cup. Remove the water, with the hands of a little bit of this powder, twist, spherical powder to give people the feeling is relatively smooth. These, just rough discriminant. But the conclusion for the user, is a production significance. Only used in the coating liquid in the precipitation of a small amount of zinc powder of the Rockwell coating, the performance will be better. So, in fact, this is a simple way to judge the performance of the Rockwell coating. 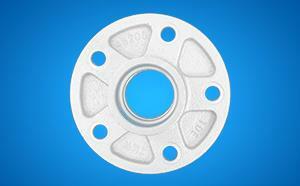 Because the use of good flake zinc powder, is to obtain a good Rockwell coating an important condition. Fake-Rockwell paint is a problem. The second is observation: because the zinc powder selected in the Rockwell coating is quite small and can be seen directly from the naked eye. So in order to confirm the actual situation of the zinc powder used, it is necessary to use tools to analyze and judge. can choose microscope observation, do not use a large magnification of the microscope, as long as you can see clearly. By observing the washing of the zinc powder that is immersed in the bottom of the cup, you can learn the details of the zinc powder selected in the coating. The homemade flake zinc powder, after being made, because the performance is not imported good, if thicker, thick diameter, or after processing did not do a good job, will be in the use of water washing method observation, precipitate, the powder used for the Nile is not in line with the requirements, the quality of the coating with this powder to be worse. However, this flake powder can be used in other water-based coatings. Because of the market profit driven, fake Rockwell coating will appear, to have the chromium of the production cost analysis of Rockwell coating, if the use of materials is relatively good, the cost of about 20,005, the use of almost materials, the cost is very low. As you can see from the coating, most of it is metal powder. In water-based coating, metal powder accounted for about Bell, if we calculate by 20%, then a ton of paint to use about 200 kg of zinc powder, assuming domestic sales of 40,000 yuan per ton. (actually around 30,000), the import of 80,000 yuan per ton, the difference of 40 yuan per kilogram. and superfine zinc powder only 10,005 or so a ton, according to each ton of coating with zinc powder 200 kg calculation, you can see that the use of imported zinc powder and domestic zinc powder per ton will be 8,000 yuan, surface using zinc powder of the coating, and the use of domestic zinc, compared to 5,000 yuan per ton, compared with imported zinc powder, the gap is even greater, This is why those who use ultrafine zinc powder to produce the price of the coating is very low, but also the reason for profits. If the use of ultra-fine zinc powder can produce quality and the use of imported zinc powder coating as good as the coating, then the cost of the Wacker coating than electroplating is a great competitive power. Hope to achieve this goal one day. If checked, zinc powder is flake zinc powder, and the use of this coating to make the quality of the Rockwell coating is a problem, this is the formula itself. The solution is to change the supplier. If you are doing, encounter this problem, have to spend money to introduce a formula, but now the formula price is not high, more than one formula, you can also take advantage of the length of the home, the coating of your liquid is of great benefit. Or you can directly introduce a chrome-free formula, after all, the chromium-free coating of the chrome is sooner or later to do, one step ahead, more than others a chance. Only the people who walk in front of the industry, the risk will be relatively small. Previous: What are the specific advantages of Dacromet metal coatings?